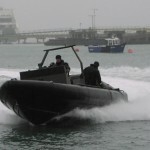 Originally designed for the UK MoD and currently in service with the Royal Marines the ORC is a fast and durable craft which has been developed to meet two main roles. 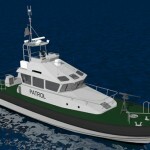 In its primary configuration it has seating for 8 passengers and is capable of delivering them from a ship over the horizon to shore safely in up to 2m of surf. In this configuration support if provided by a forward gun mount which can take a single or twin GPMG. In the second role the craft can be converted into a Fire Support Platform (FSP) by removing the troop seating and fitting an aluminium module which provides enhanced ballistic protection and an additional two weapon mountings which can take either single GPMG or .50 Cal machine gun. As part of the system there is an additional framework which gives enhanced ballistic protection to the forward gun position. Swapping between Troop Carrying and Fire Support Platform (FSP) can be completed in less than 60 minutes. The ORC is designed with portability in mind. It can be transported and launched by trailer, features 4 lifting points inboard allowing it to be under slung from a helicopter and has tie down points for securing it to the deck of a ship or hold of an aircraft. The lifting points coupled with a painter system means that the boat can be launched from a mother ship whilst underway. Weapons – Forward pedestal for single or twin GPMG. Transportability – Air transportable in C130 J MK IV. Under-slung Chinook CH47 and Merlin Helicopters. Removable seating and fairings for ease of transportation and flexibility of function. Optional road trailer conforming to EU regulations.